“I am a one hit wonder who wants to be a two hit wonder,” admitted Peter Coyle, the lead singer of the eighties band The Lotus Eaters, but actually they were a two hit wonder, it’s just that nobody remembers their second hit You Don’t Need Someone New which only reached number 53. 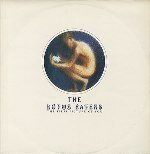 The Lotus Eaters were formed in Liverpool in early 1982 after the demise of Coyle’s previous band, The Jass Babies. “They were a very raw band,” he admitted, “But the Lotus Eaters were something entirely different.” Coyle teamed up with Jerry Kelly who had fronted another Liverpool band called the Wild Swans. If you look at any picture of the Lotus Eaters you would believe they are a duo, but in actual fact they are a five-piece band. The other three were Jed Quinn (keyboards), Mike Dempsey (bass) and Steve Creese (drums) but, by mutual agreement, none of them appear in photographs nor give interviews, so in most people’s eyes they are a duo. The Peel session came about after they’d sent John a demo but by the time John got to hear it and offered them a session the Babies had broken up. The pair had their own Sylvan record label and the record company war was won by Arista who, not only signed the duo, but bought the label too. “I’d always dreamt about being on Top Of The Pops,” Peter admitted, “But it was awful and it felt so crass. Miming. Nonsense!” Their debut album was called No Sense of Sin and produced by Nigel Gray who had previously worked with The Police and Siouxsie & the Banshees but it spent one lonely week at number 96 and with the failure of the follow up single, Arista dropped them like a hot potato and by the mid eighties they split up. In 1993 Coyle began recording again with the Jass Babies. In 1997, some old radio session albums were released in Japan and it triggered a compilation album also called No Sense of Sin. The pair reunited properly in 2001 for a brand new album called Silentspace. But that was it.